Two of the most successful programs of all time clash for a berth in the National title game. Only one of last year’s finalists will be returning to the National Championship game after both Stanford and Oregon won their quarterfinal matchups, setting up a rematch of the title game in this year’s semifinals. Entering the weekend as favorites to get this far, their route the this point has been surprisingly dissimilar. Stanford has been dominant — arguably the best team in Raleigh so far. Oregon, however, has been thrown for a loop, only to respond by igniting into a ball of flame that has consumed their last two opponents in elimination play. The story for #1 ranked Oregon took an unexpected turn when they suffered a shocking loss to Virginia to close out pool play. Fugue had looked mostly unchallenged through their first three pool play games, but suddenly were relegated to prequarters. Sour after the way that game ended, the reigning champions turned their frustration into fury and that fury into production. They laid waste to Wisconsin in the prequarters and, after a close first eight points, left UCLA in the dust in the quarterfinals. Oregon is playing their game with renewed vigor and a destructive level of intensity. Meanwhile, #3 seeded Stanford Superfly has been blowing out teams all tournament long. Their only real test came against Washington, but even that was a four point win after they took control in the second half. Aside from a 15-11 victory against Colorado College while resting their starters, Stanford has otherwise beaten opponents by wide and unassailable margins. They’ve played by far the fewest points of any semifinalist and should be very fresh heading into this afternoon’s matchup. There’s a long list of stars to watch between the two teams. After winning a title over Stanford last year, a crew of Oregon fifth years are back for more. Player of the Year candidate Jesse Shofner’s signature game leads the way, along with Beth Kaylor, a finally-healthy Alex Ode, and Olivia Bartruff, the scoring leader at Nationals. Even beyond that group, Ella Hanson and Hayley Wahlroos have been dynamite throwers. Stanford’s returners also drive their success, headlined by Monisha White, Anne Rempel, freshman Hallie Dunham, and athletic monster Courtney Gegg. They have a deep cast of role players that don’t back down. The matchup promises to be intense. Oregon holds the 1-0 advantage over Stanford n the season, winning 12-9 at the Northwest Challenge. But the two teams will be very familiar with one another after having studied their National Championship footage. Oregon coaches called the game a “grudge match” and, with the fury they’ve been playing with, that should be evident on the field. Stanford coach Robin Knowler acknowledged their familiarity, but also pointed out that last year’s title bout was played under vastly different conditions. The wind played a massive role in that matchup, but even in today’s rain, the environment will not warp the game nearly as much. The deciding factor will likely be who can force the game to move at their preferred pace. Fugue is famous for the outrageous speed with which they play, as if the fast-forward button on the remote was stuck. Superfly will want the game to slow to a crawl, where they can use their skilled throwers, big downfield targets, and depth to overwhelm Oregon. If the game is at warp speed, expect Oregon to march to their sixth straight final and to continue their quest for a National Championship. If the game’s pace calms, Stanford will be the victor. 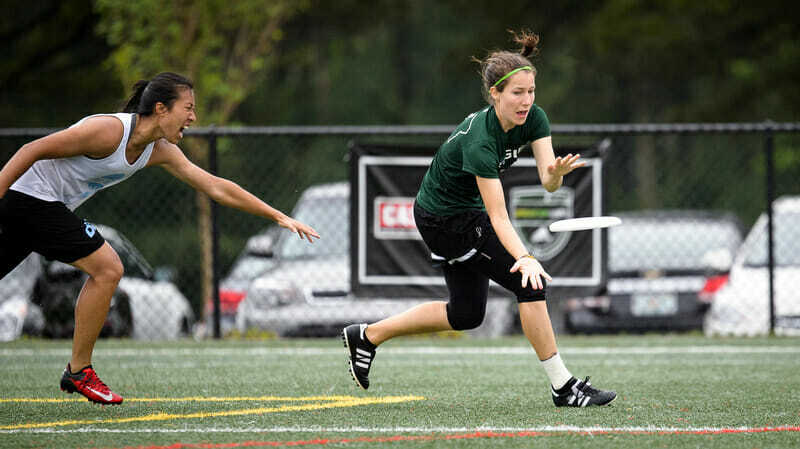 Comments on "College Championships 2016: Stanford-Oregon Semifinals Preview, Presented By Spin Ultimate"